Well my gorgeous mittens have hit a brick wall. 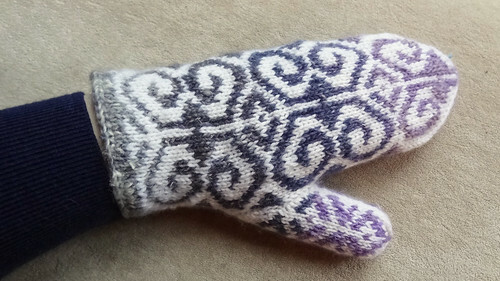 I now have two finished outer mittens and they look lovely. This was aided by new purchase. After working with the colourwork chart, I remembered how difficult it is to keep the paper pattern on my lap and keep marking it off. I did use highlighter tape, which was great but didn't stop the paper bending and sliding off my lap. 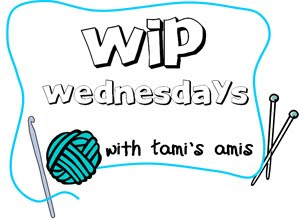 As I know that after this project I'll be doing more stranded colourwork and lace charts I decided to splash out on something I've wanted for a while. It's the Knit Pro Chart Holder. It is the same fabric finish as the needle case I have, which is designed to hold my KnitPro Options, plus a small project. 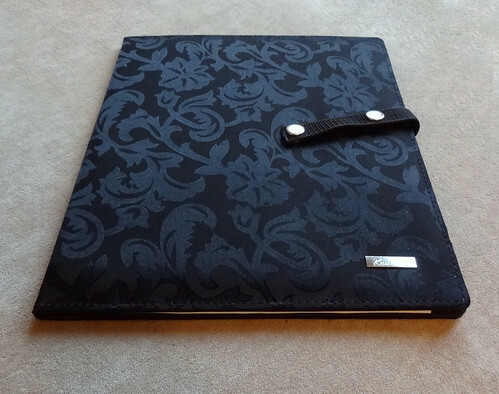 (I have to confess my case doesn't have room for a project as it is stuffed full of notions!) This chart holder is the larger size and I got it from Hulu. I've used them before and they are great for service, plus they have a great magazine selection, though sometimes I wish I could choose to have something delivered from them, that I didn't have to sign for! At least it arrives properly if you have to sign for it, I suppose, but it does mean waiting in for a package that could fit through the letterbox. This chart holder has three small powerful magnets that hold the paper in place. There is a long magnetic strip that you use to mark your current row and then you can close the whole thing up to keep it marked properly. The closure tab also is used to keep the chart upright, if required, either in landscape or portrait mode. You can see on the above picture the highlighter tape that I had been using. I believe that you can get longer strips of highlighter tape, which would be better for marking long rows than the little tabs I have. 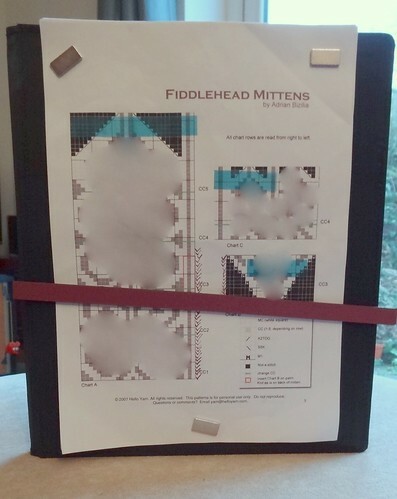 I have blurred out the charts, as this is not a free pattern! I used to have something very similar to this chart holder, that I used when I used to do cross stitch, except it was a metal sheet that was attached to my sewing frame. This is much better for carrying around with my knitting and it is better for sitting on my lap, which is usually where my patterns rest. So with my new whizzy chart holder you'd think everything would be going quickly, and it did, as you can see from my outer mittens. 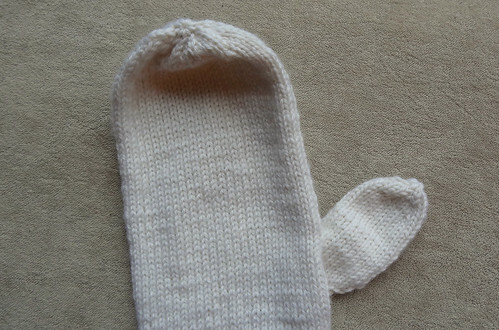 But things have ground to a halt somewhat after finishing the lining of my first mitten. It looks great. 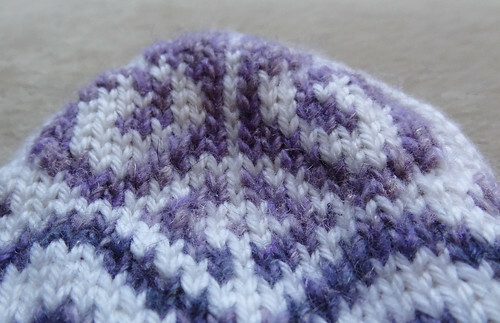 I love how crisp the lining edge looks after picking up and knitting stitches from under the I-Cord cast on. It even looks great when you put the mitten on. What you can't see from this picture, is how bunched up the lining is. 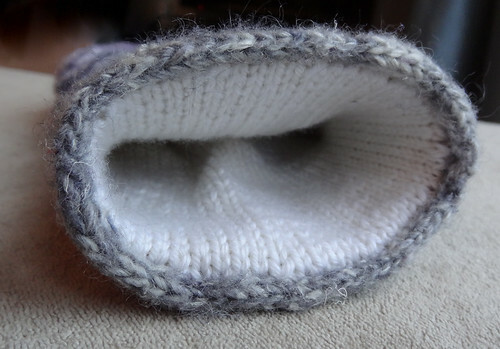 The picture below, shows a little bit of how the tip of the liner is bulging out the mitten top. But it is only when you look at the actual liner that you can see the real extent of the problem. After hitting this brick wall, I decided to have a look at the helpful notes section of the projects page for this pattern. I should have done this before I started knitting, as I am not the only person to have this problem. Lucyann's notes give her changes to the liner to make it smaller. I'm not sure if I need to change things quite so drastically, but this is what has caused me to pause. I need to reduce the bunching at the top. I'm almost tempted to rip back the top edge of the liner and reduce it back to before the decreases, plus a few more rows, then perform the decreases , plus a few extra and then graft the end closed rather than pulling the stitches together to form a bulky ring of stitches. I think that might work. I want to get these mittens right. They aren't any good to me if they are uncomfortable, no matter how nice they look. Someone suggested that I line the mittens with fleece, and I'm sort of thinking that might work well, especially as I have enough Noro left to knit another pair of mittens. 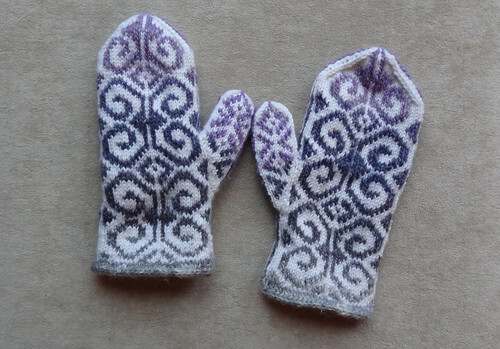 If I saved the main yarn and didn't knit the liners, then I could knit someone else a pair of these mittens, and I KNOW that idea would be popular, as everyone who has seen these mittens wants to steal them from me! So, while I have some thinking to do, I hope that this problem can be resolved soon, as the weather is getting colder and I need to get some wear from my lovely new warm mittens. To look at other works in progress, that hopefully don't need so many problems solving, click on the button.